I owed this instructable to my Palm Arduino Kit fan! I did mentioned in my previous instructable "Palm Arduino Kit" that I built the kit to accompanied me while I do the traveling. And a real journey of my Palm Arduino Kit did happened! We took a trip to Thailand and Japan. NOTE: I did the original instructable version totally on my iPod Touch 4, but catastophy struck! For that reason, I had to started over from scratch in this instructable on the PC. And this instructable had been delayed for more than three weeks after the trip ended. Finally, I did finished it! So, enjoy! And thanks for reading. As I said earlier, one thing that was different than the previous year, I took a new member of the family, Palm Arduino Kit for its first journey! Later, I decided at the last minute to take Palm Arduino V3 on the journey with us too. We planned to go to Japan earlier (in 2011), but it was canceled because of the Tohoku earthquake (8.9 Magnitude) in Japan. We supposed to attend our niece, "Momo", Keng's graduation, (Bachelor degree from University of Tokyo) at about the same time of the earthquake. So we had to cancel the trip. Keng "Momo" was graduating with a Master degree from Waseda University in Tokyo, this year. So we intended to go no matter what! We got several e-mails from Keng's sister regarding Japan Trip (from March 9 - 16). We heard that the original group that supposed to go to Japan tour to cerebrate Keng's undergrad. in 2011 were going to Japan this year too! The estimate head count would be around 12 peoples (almost all of them are related) that would be going from Thailand. My mother-in-law and sister-in-law were added to the group later. So the final count was 18, including Keng "Momo", who's already in Tokyo. The youngest person in our group was 7. The oldest was 82 (my mother-in-law). This trip would be fun! My wife and I (and Palm Arduino Kit) had the different flight schedule from the rest of the group since we booked our own flights from the US. We would be in Japan one day ahead of the group, then the group and Keng would come to pick us up at the hotel where we were staying near Narita Internation Airport. Lah, Keng's cousin, who's also helped plan the trip to Japan, send us the final brief of our tour. Lah was going to be our honorary tour guide as well. She used to studied at a university in Kyoto some time ago. Then the group were flying back to Thailand from Osaka, except Keng, my wife and I. Keng was staying in Tokyo until the end of March for here actual Graduation ceremony then going back to Thailand. My wife and I were staying in Tokyo until March 19, then flew back to the US. A week before the trip began, I tested Palm Arduino Kit. Some more components, Photo Sensor, RGB LEDs, jumper wires, resistors were added. I also sew an Instructables Robot Patch on to my backpack, and put an Instructables Robot Sticker on the back of Palm Arduino Kit case. We (my wife and I, and Palm Arduino Kit & Palm Arduino V3 in my backpack) in the taxi headed to the airport. We followed the airline's advice by went to the airport with enough time, three hours, ahead of flight schedule for international flight. So we would have time to check baggages, and going through the airport security. We went through the Airport with no problem at all. We have enough to to rest before getting on board. The plane were on schedule and we were among a few first group to be boarded. So we got some space on the overhead cabin for our carry-on luggages. This flight were fully packed, I hardly see the unoccupied seat. About half way through the flight, we crossed the International Date Line(IDL) toward westbound. So we lost 24 hours, meaning that 24 hours of time was being added, and we were advancing the calendar date by one day. About have way to Tokyo, I played with Palm Arduino Kit. Experimented with Palm Arduino on the plane. On the second Leg from Narita International Airport to Bangkok was nothing fun. The flight was packed, hardly see an empty seat! I got a seat along the aisle. And do not want to play with Arduino since I was so tired and did not want to do something that might be suspicious to other passenger (blinking LED with Arduino might alarm someone who do not know anythng about it!) I just took a rest (sleep) all the way through. We arrived Bangkok at around midnight of Mar 20. (Local time) That make us lost a day there! My sister-in-law picked us up at the airport. We went to bed around 3PM in the morning. I spent my second night (Feb 21) in Bangkok at my mom's condo. And in the next day afternoon, I went to pick up my wife and Ar Ma - my mother-in-law to the airport, for the trip to Chiang Mai the next day (Feb 22). My sister-in-law joined us at the airport. We arrived Chiang Mai International Airport after about an hour flight from Bangkok. Chiang Mai is the largest and most culturally significant city in northern Thailand. Chiang Mai, a second largest city of Thailand. The average low temperature of Chiang Mai is around 31.8°C (89.2°F), and the average high is around 20.1°C (68.2°F), which make it a lot nicer than the weather in Bangkok! The inhabitants speak Kham Muang (also known as Northern Thai or Lanna) among themselves, though Central Thai is used in education and is understood by everyone. We were staying over night at my sister-in-law's house in City of Chiang Mai (Chiang Mai is also a name of the Province). We are so familiar of Chiang Mai (we goes there every years). So we were kind of tired of going to famous night bazaar, or any other tourists spots. We were spending most of the time cooking, eating, and having the good time together in the family. 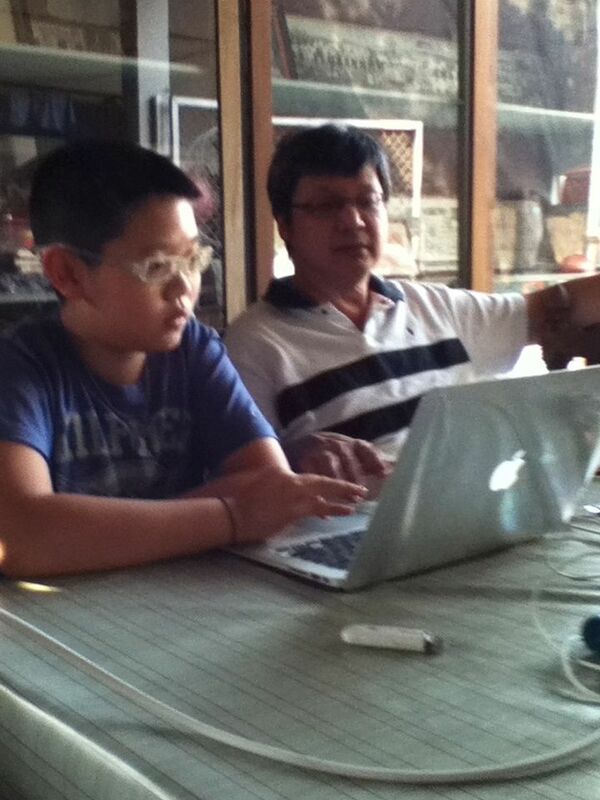 Next morning, (Feb 23) Wit, my 13 years old nephew from Bangkok, arrived at my sister-in-law's house. He saw me working on my Palm Arduino Kit and Palm Arduino V3. Wit asked me about it. We talked about what he did with the gift I gave him a year ago (Solar powered car kit). He also mentioned about wanting to be a programmer in the future. "What's a coincident!" I thought. So, I taught him how to program with Arduino IDE, and showed him how to blink the LEDs with my Palm Arduino Kit. He was able to do so in a very short time. So we relationship bonded closer since. Later in the afternoon, my other sister-in-law's husband drove us from Chiang Mai to their home in Wieng Papoa, a town in Chiang Rai. The the 175 Km (108.74 Miles) ride to Chiang Rai from Chiang Mai took approximately two hour and a half. Things are on a smaller scale here, the city has a more relaxed atmosphere, and less pollution. Chiang Rai is the northernmost large city in Thailand. The average low temperature of Chiang Rai is around 18.6°C (65.5°F ), and the average high is around 30.7°C (87.3°F ), which also make it a lot nicer than the weather in Bangkok! I liked being in Chiang Mai or Chieng Rai more than being in Bangkok. Before dinner, Wit and I had a game of chess on my laptop. "Sorry, Wit, you needed some more practice!" I won! After dinner, Ar Ma - my mother-in-law and her grand children float the lid lanterns for good luck. Experimented with Palm Arduino in Chiang Mai. Today we were attending the Quinming Festival. My other sister-in-law's husband drove us from their home to visit my father-in-law's grave site. Wit and his little brother joined us in stead of riding with their mother. It took about an hour drive to the site. Tomb Sweeping Day and Clear Bright Festival. A family obligation, a celebration, and as a time of reflection, and to honor their ancestors at grave sites. Celebrants join hands to sweep the tombs of their ancestor(s). Then the family will offer food, liquors, burn spirit money and paper replicas of material goods such as cars, homes, phones and paper servants. Wit and I decided to make an offer to my father-in-law's grave with Palm Arduino Kit and Palm Arduino V3. At the end of ceremony, someone lit up the fire crackers, as it believed to help ward off the evil spirit that wanders on Qingming. After the ancestor worship at the grave site, we went to my wife's uncle house, about half an hour drive, to have lunch with those relatives who attended the Qingming. Wit and his little brother, left with his mother to Bangkok after lunch. We went to visit my other brother-in-law's restaurant in the city of Chiang Rai (same name as Chieng Rai Province). And we headed back to my other sister-in-law in Chiang Rai. Step 4: Chiang Mai, Again! On Feb 25, My sister-in-law's husband drove us from their house in Chieng Rai back to Chiang Mai. We had lunch at a restaurant along the way. We were staying in Chiang Mai for another three days. Our old friend, we met many years ago in Chicago, came to take us out and drove us around to see the suburb of Chiang Mai. On Feb 28, we flew back to Bangkok. We did not do much. We just enjoyed these days with our families, my wife with hers, and I with my mom at the condo. Today, there were two important events happening, the all day event was Governor of Bangkok Election day, and Ar Ma (my mother-in-law) birthday party. I accompanied my mom to go to cast her vote at the poll. In the evening, we (included Palm Arduino and Instructables Robot) were invited to Ar Ma's birthday party. We were not very busy with other business today. So we decided to go to Wat Phra Kaew, or Temple of Emerald Buddha and The Grand Palace, with a quick stopped at Wat Mangkon Kamalawat or Wat Leng Noei Yi, to pay homage and pray for the blessing. In order to avoid the road traffic especially in China Town Area, we took the Water Taxi along Chao Phraya River, a major river in Thailand, with its low alluvial plain forming the centre of the country. It flows through Bangkok and then into the Gulf of Thailand. (Source: http://en.wikipedia.org/wiki/Chao_Phraya_River). We got off the water taxi at the Rachawong pier, the the closest pier to the China Town. Then took "Tuk Tuk", an auto rickshaw or a three-wheeler for a short distance ride to Wat Mangkon Kamalawat or Wat Leng Noei Yi. Then took a taxi to Temple of Emerald Buddha/Grand Palace. A statue of the sitting Buddha, made of green jadeite (rather than emerald), clothed in gold, and about 45 cm tall. Historical sources indicate that the statue was discovered in northern Thailand in the Lannathai kingdom (Presently, Chieng Rai province) in 1434. The people believed the figurine to be made of emerald, hence its name. The statue is adorned with garments made of gold. There are three different sets of gold clothing correspond to Thailand's summer season, rainy season, and cool season. Temple of Emerald Buddha is one of several quarters that are parts of the Grand Palace. The Grand Palace is a complex of buildings at the heart of Bangkok, Thailand. The palace has been the official residence of the Kings of Siam (and later Thailand) since 1782. The king, his court and his royal government were based on the grounds of the palace until 1925. After the visit at the Grand Palace, we had lunch at a noodle store near by the Grand Palace. Then we headed home by Express Water Taxi along the Chao Phraya River. This trip to Thailand was a routine trip that we did every year, by spending time with my mother and our families, goes to Qingming, do some shopping, going out for a good foods, etc. For us the trip to Thailand was not the end, we are continue to Japan next. But for Palm Arduino and Palm Arduino V3, their first journey stopped here in Bangkok for now. I decided to leave my Palm Arduino, Palm Arduino V3, FTDI cable (not the one with the Palm Arduino Kit), and other components - Photo sensor, RGB LEDs, resistors, Motor Driver(L293D), and 555 IC with my nephew, Wit. So he can uses them, experiments with them, etc. I was not regret to let them go, I knew that they are in good hand. And they are still with my relative, not the stranger! There is a good chance that we come back next year and we could have another journey together again. I was taking the and 5V regulator, Palm Arduino case (with Instructables Robot) with me to the following trip to Japan. The trip to Japan was planned before but did not happened. It was two years ago, when our niece Keng "Momo", got her Bachalor degree from University of Tokyo. The trip was canceled because of the 8.9 Magnitude earthquake and tsunami in 2011. This year, Keng "Momo" was about to finish her Master degree in March. So we were all agree to take another trip to visit her, and cerebrate her graduation. Early in the morning, my wife and I (and part of Palm Arduino Kit, included Instructables Robot) were scheduled to leave for Japan one day ahead of our family tour group. Since we booked our own airplane ticket, separated from the group. After almost six hours on the plane we arrived Narita International Airport around three o'clock local time. We decided to store our largest luggage at the luggage service at the airport so it won't be the burden during the stay in Japan. Then we took the free shuttle bus to the hotel in Narita, about 4.7 Kilometer (~2 Miles) from Narita International Airport. After checked in to the hotel, we went out for a walk, and took a few photos in the neighborhood. Very nice town I would say, also very clean and tidy. We bought our dinner back to the hotel from local convenience store around the corner. In the morning, we checked out of the hotel after late breakfast. And we waited for our tour group which arrived at Narita Internation airport this morning, to pick us up here at the hotel. Around 10 AM. the group came. Our tour was officially started! Eventhough, a family of four peoples were joining the group later in Tokyo. There were arriving at Haneda International Airport later in the late evening. It's about an hour by bus from Narita to Tokyo. Our tour bus took us over the Rainbow Bridge and made a short stop for pictures taking. Then we went to Odaiba. We visited so called Palette Town, which consisted of a large shopping complex, an amusement park with very large Daikanransha (Ferris Wheel). Later in the afternoon, we visited Senjo-ji Temple, an ancient Buddhist temple in Asakusa area. This temple is the oldest temple in Tokyo. Here we saw Kaminari-Mon (Thunder Gate), the two outer gates with a big red lantern. We bought some good luck charms to give to some friends. The last place we visited for today was Waseda University, where our niece, Keng (or Momo as her Japanese friends called her), just earned her Master degree. Eventhough we did not attended her graduation ceremony which were held at the end of March, but this trip brought together the families together to celebrate her graduation. After we checked in to the hotel in the evening, we (my wife, my mother-in-law, my sister-in-law, and I) went out for dinner at the restuarant in the shopping mall in Ikebukuro area, which is very close to our hotel. The first day we had breakfast buffet at the hotel. It's very convenient for us especially my mother-in-law. After breakfast, we met and were introduced to our new members of the groups (a family of four). Now, the group had the total of 18 members. We got on the bus and headed to the next destination, 230 Kilometers (142 Miles) away from Tokyo. We were very lucky that our driver chose to go through Yamanashi-ken or Yamanashi Perfecture. So we saw the Mt. Fuji along the way to Matsumoto. Along the way, we stopped to have lunch at Suwako Service Area. Here we saw Lake Suwa, which is the biggest lake in Shinshu, surrounded by mountains, in the center of the Suwa basin. After we got to City of Matsumoto, we went to visited Matsumoto Castle. Matsumoto Castle, also known as Karasu-jo ("Crow Castle") as the exterior wall has black color, is registered as one of Japan's National Treasure. The castle has been standing for 400 years. Amazing! Later, we visited a Matsumoto old town street called Nawate Dori. This street is consisted of small shops with a subtle but recurring frog theme. There is a cute place to pick up pottery at a good price, and plenty of cute frog trinkets. People here believe that frog represented the return of prosperity (money). This is especially valuable in or on your purse, as it will bring you money. I bought one for myself too. We checked in the hotel at around 6PM. We were told about the hotel along the way, that the hotel required the guests to dress up in Yukata dress (or casual summer kimono) for dinner. Very nice! So we had a Japanese banquet among the families, in the Japanese style "Yukata" dress. Excellent! I loved it. The food was very delicious. Everyone was happy about it. I could tell. The hotel also has the hot springs pool available free for the guest to enjoy. We had breakfast together again in the morning. It was optional if anyone want to dress in Yukata for the breakfast, no one did! Probably, nobody want to go back to there room again for the change to their everyday dress. After the breakfast, we got on the bus and headed to City of Takayama, in Gifu Perfecture. The distance between Matsumoto to Takayama was about 65 Kilometers (40 Miles). The Japanese Alps were still in sight as the bus moving along to Takayama. We passed the dam between the mountain. When we arrived at City of Takayama, we visited Sanmachi Suji, the historical merchant houses. These old merchant and artisan houses have been converted in private museums, traditional restaurants or souvenir shops. We agreed to have something different for a change! So we (Me, my wife, and in-laws: mother, brother, sister) decided to have lunch at the tofu food specialty store called Noguchi-Ya. Later, we walked (about 10 minutes walk) to Takayama-Jinya, the most important historical building of the city. Takayama-Jinya was the old residence of the governor of the Hida province appointed by the Tokugawa shogunate in Edo Era. (from 1692 to 1868) This building s the only building of its kind left in Japan. All the other Jinyas were torn down after the restoration of Emperor Meiji in 1868. In the Jinya, there are Guest Room (Zashiki), Offices (Onyakusho and Goyouba), Civil Court(Oshirasu), Law Court and Interrogation Room (Oshirasu, Ginmisho), Straw Rice-sack Storage Room (Onkura). The farmer in those day, stuffed the rice into the straw rice-sack which is weight about 60 Kilogram (or 130 pounds) and used it as the tax payment. Takayama-Jinya is also registered as one of Japan's National Historic Site. We checked in the hotel at around 5PM. Then went out for dinner at the restaurant in the area, most of the store in the area were closing around 6:30PM. We had breakfast buffet at the hotel. Before we got on the bus and traveled to Shirakawa-go, we walked (about 10 minutes from the hotel) to the Miyakawa Morning Market. Most of the produce that farmers brought from the village in the mountain around the town reflected the change of the seasons. It took about an hour for the bus to take us to Shirakawa-go, the Historic Villages of Shirakawa-go is designated UNESCO World Heritage sites. Famous for their reputation to their traditional pointed thatched houses with triangular roofs. As their sloping roofs do not allow the snow to lie on it. Since the village is one of the most heavy snowfall in the world, this type of roof were created. We had our lunch in the village at Nomura Restuarant which is famous for its soba (buckwheat noodles). The noodles are rolled by hand and made fresh each day. Next we stopped by at Hakuza (http://hakuza.com) a producer of the gold leaf, and souvenir made out of gold dust and gold leaf. At the store we were greeted with a cup of hot tea with a small piece of gold leaf in it. The presenter said that it won't do you no harm! And they show us the machine and gold leaf that was so thin, about 1/10,000 to 2/10,000 of a millimeter thin. WW! that thin. Late in the afternoon, we left Gifu and headed to a city of Kanazawa in Ichikawa Perfecture and stayed overnight there. We got to Kanazawa in about a little more than an hour. It was raining when we were in Kanazawa. My wife and I went out to get some food for her mom and her sister at the convenience store nearby. After breakfast buffet at the hotel, we went to visit the Ancient Site of A Samurai House (The Family of Nomura). I saw intricate carvings and beautiful small gardens. The house itself is well preserved and maintained, completed with tea-ceremony room. It's really a privilege to pay a visit to this spectacular house. The next visited was Kenrokuen Garden. The weather was very cold and windy. There were some light snow ferry occurred from time to time. Some kid in our group tried to catch snowflake with their tongue. Our guide, Lah, told us about the distinguish features of the garden, the the oldest fountain in Japan, a two legged stone lantern, Karasaki Pine, Yukitsuri or a conical array of ropes created to support tree branches protecting the trees from damage caused by heavy snows, and the six attributes of the garden, Shigure-tei, a tea house that was originally built by the 5th lord Tsunanori. Now, come back to the name of this garden, "Kenrokuen", I learned that it literally means "Garden with six attributes" or "Six Attributes Garden". Such a suitable name! And I was really glad to mad a visited to this garden. In the afternoon, our bus left for Kyoto. It was about 260 Kilometer (161 Miles) from Kanazawa to Kyoto. On the bus along the way to Kyoto, Momo told us a story about today (Thursday, Mar 14). It has a tradition of a boy to give a girl a chocolate to tell a girl who gave him a flower on valentine day, that he like her. This tradition is only happen in Japan only! We checked in to the hotel at around six o'clock. Then we went out for dinner at a shopping center nearby the hotel. We had breakfast at the hotel. Then we went to Kiyomizu-dera. Kiyomizu-dera The temple was founded in 798. The main hall has a large veranda, supported by tall pillars, that juts out over the hillside and offers impressive views of the city. There is not a single nail used in the entire structure. After Kiyomizu-dera, we visited Fushimi Inari Shrine. Fushimi Inari Shrine located in southern Kyoto. The Shrine has ancient origins, predating the capital's move to Kyoto in 794. It is famous for its thousands of vermilion torii gates. Foxes are thought to be Inari's messengers. Then we went on to visited Kinkaku. Kinkaku, the Golden Pavilion, is a Buddhist hall or library of the relics of Buddha. Kinkaku is a three-story building on the grounds of the Rokuon-ji, a Zen Buddhist temple. The top two stories of the pavilion are covered with pure gold leaf. We were not allowed to go inside the pavilion. But from what I was told, each floor of the Pavilion were designed to used three different architectural styles, which are shinden, samurai, and zen. The Pavilion extends over a pond, known as Mirror Pond, that reflects the building. Rokuon-ji is designated as a World Cultural Heritage in 1994. And we continued our tour to Heian-jingu. The Heian-jingu is a Shinto shrine located in Sakyo-ku, Kyoto. It is listed as an important cultural property of Japan. The Shrine’s torii is one of the largest in Japan. The Heian-jingu was the last place we visited for the day. The bus took us to the next destination, Osaka. It took about almost an hour to get to Osaka. Our hotel located in Namba area. We checked in to the hotel and went out for dinner right where the shopping located. The waitress of these restaurant dressed up in Yukata. And we went shopping after the dinner. Early in the morning my wife and I helped Ar Ma and my sister-in-law to pack their luggage. The group were departing Japan to Thailand today. We helped them get the baggages to the hotel lobby. After they had their breakfast, we helped them loaded the baggages to the bus. And we send them off to Kansai International Airport at the hotel. Then the rest of us, Keng(Momo), my wife and I had our breakfast at the hotel. We checked out off the hotel but left our baggages at the hotel's front desk. Today we planned to visit Koyasan and take the Shinkansen, the Super Express Train (or Bullet train) back to Tokyo. Keng (Momo) were staying in Tokyo until the end of March for her Graduation ceremony. My wife and I were staying in Tokyo for three more days. Koyasan is the name of mountains in Wakayama Prefecture to the south of Osaka. Koyasan is also known as the world headquarters of the Koyasan Shingon sect of Japanese Buddhism. In 2004, UNESCO designated Koyasan as World Heritage Sites. We took Nankai Railways from Osaka's Namba Station to Gokurakubashi terminal station. Then transferred to the cablecar which travels up the mountain to Koyasan. From the top station, we rode the bus into the town center and walked to Dai Garan. Around noon we had our lunch in town. And then came back to the hotel to pick up our baggage. We went to Shin-Osaka train station to get the train ticket to Tokyo. Keng(Momo) asked the ticket sale personnel for the seats on the side that we could see Mt. Fuji along the way. The Shinkansen also known as the "Bullet Train", is a network of high-speed railway lines in Japan operated by four Japan Railways Group companies. The Tokaido Shinkansen, the one that we took from Osaka to Tokyo, is the world's busiest high-speed rail line. Between Tokyo and Osaka, the two largest metropolises in Japan, up to thirteen trains per hour with sixteen cars each (1,323 seats capacity) run in each direction with a minimum headway of three minutes between trains. First operated in 1964, the Tokaido Shinkansen was the world's first high speed railway line. This was the reason why I want to have a journey with this train! And I was told that the train ran at the speed of 250 km/h. The ride was really smooth. From inside of the train it's really hard to gauge the speed of the train. We were so lucky that we saw Mt Fuji from the Shinkansen! After about three hours ride, we arrived Tokyo at around 7PM. We took Keng(Momo) out for dinner at a restaurant nearby after we checked in the hotel. Keng left to her apartment the dinner. We had breakfast at the hotel. Then we went to Hamamachi station to join the Mt Fuji Tour group at 9AM. There were three tour buses to Mt. Fuji, we were assigned to the bus number 2. Our group consisted of about 30 peoples. The weather today was nice. After a while, our tour guide, Emi-san, told us that we should be able to see Mt. Fuji appearing in any minute, from the right side of the bus. We were lucky to get the seat on this side of the bus. Again, we saw Mt Fuji from the tour bus. This was the fourth time we saw Mt. Fuji from the distance, first on the plane from Bangkok to Tokyo, second time on the tour bus from Tokyo to Osaka, the third time on the Shinkansen, the Bullet Train from Osaka to Tokyo, and this fourth time, on the way to meet her up close. According to Emi-san, our guide, she told us that so many tourists that came with this tour complained that they never see the Mt. Fuji from the distance once, due to the bad weather, too much cloud, etc. We were grateful that we saw her so many times. But not totally lucky, since Emi-san told us that we could get up to station 4 only. Station is not open yet, because there were too much snow. Our tour bus stopped at station one, tourist information center, for a bath room break, photo shoot, and souvenir shopping. Then we went to station five, where we could see the top of Mt. Fuji closely. Here there was also a platform for the tourists to go up and take the photos of the Mt. Fuji and the Japanese Alps. Then we came down to the bottom again and went for lunch (included in the tour package). After lunch, We went to Lake Ashi, in Hakone. Then we got on board the boat to cruise in the lake. It was very cold on the lake! We were dropped off at Hakone-en pier, and got on the Hakone-Kamagatake Ropeway, cable car that took us to Koma-ga-take Sancho. The cloud moved in to cover the area, so we were not able to see Mt. Fuji from the top of Koma-ga-take. We came back down to the shopping area, and brought some gifts for friends. Then got on the bus back to Tokyo. Some of the tour group members took the Shinkansen back to Tokyo or may be somewhere else, eg. Osaka. We were dropped off at Ginza at around 8PM. And we took the train back to the hotel. We had dinner at a restaurant near the train station. We had our breakfast at the hotel. Keng (Momo) was coming to meet us at Ueno Park. Today was very windy day! Before meeting time with Keng, we walked into the Ueno Park, and what we saw was the Cherry Blossoms were blooming in the park. We were so glad that at least we saw Cherry Blossoms bloom before we left Japan. We taught about visited the Museums in the Park. Unfortunately, they were closed on Monday. Keng (Momo) came to meet us at about 10AM. She took us to Skytree Tower. We took a bus to Skytree Tower. But it was closed due to the strong wind, we were so disappointed! Next, Keng (Momo) took us to Imperial Palace. We hung around the palace and took some photos, to go inside we needed to reserve the ticket in advance. After the Imperial Palace, we walked to Tokyo Station. and took some more pictures at the station. And we had lunch nearby. After lunch we visited Meiji Temple. We noticed that Keng did not feel well, so we send Keng back home. My wife and I walked along the shopping area around Shibuya, then took the Yamanote Train back to hotel, stop to have dinner at a restaurant before going to bed. We had breakfast at the hotel. We changed our plan from going to the museums in Ueno Park to go back to Skytree Tower instead since the weather was a lot better than yesterday. The reason we chose the Skytree Tower other than the museum was that the Skytree is the tallest structure in Japan, and the second tallest structure in the world (the tallest structure is Burj Khalifa in Dubai, 829.8 m (2,722 ft)) and it is the tallest tower in the world. So we checked out from the hotel, and we left our carry-on luggages with the front desk at the hotel. This time we did not have Keng to be our guide. So I asked the front desk the way to get to the Skytree. We found a little difficulty finding the way to the Skytree Tower. After we got to the Skytree Tower, we rushed to the line to get the ticket up to the Tembo Deck (350 Meter Deck), about 1,150 ft. We had to wait in line for two hours, got to see Tokyo from the top of Sky Tree at noon. We spent only about half an hour up there. We did not go up to Tembo Galleria (450 Meter Deck) or about 1,480 ft. since have to pay 1000 Yens each to go up there. Skytree used the official height of 634 Meter (2080 ft.), which related to the words Mu(6), Sa(3), Shi(4). The combined word "Musashi" also referred to the name of the area that Skytree stands. Skytree Tower is also earthquake resisted structure. Around 1:30 PM, we went back to the hotel to pickup our carry-on luggages. Then we bought the Express Train (2400 Yens/person) ticket from Ueno Station to Narita International Airport. The train took about 40 minutes, to go to the Narita International Airport. We had lunch/dinner at the airport our usual place that we always have, when we are transiting at this airport on the way back and fort to Thailand. 6:05 PM was our flight schedule to go back to Chicago. We departed Japan on time. Sayonara, Japan. See you again soon! Did you have any issues with taking electronics through the airports security? No. I did not have any issue.